she served her heart on a silver salver. Drafty poem for With Real Toads, micro poetry prompt by the wonderful Kerry O’Connor. I have been very slow returning visits but will get there. The painting of St. Agatha above (whose breasts were amputated in a christian martyrdom) is by Lorenzo Lippi. Process Note – St. Lucy and St. Agatha are both Christian (medieval) saints who lost their eyes/breasts as punishment for being believers (though performed some miracle of not dying from their initial punishments.) They are often depicted in renaissance paintings, Lucy with her eyes on a platter, Agatha, as above. This entry was posted on October 11, 2015 at 9:21 pm and is filed under poetry. You can subscribe via RSS 2.0 feed to this post's comments. Very strange to self-mutilate, even to give the heart a voice beyond a beat! Complex indeed! Gruesome – and yet I like that you have written it so matter-of-factly as well as, in way, tenderly. I think this is beyond complex.. it’s gruesome and sad.. and imagine she was only 15 year old. What a powerful and chilling image: the mutilation of women cries out against nature. Your poem reminded me too, in this breast cancer awareness month, how many women must suffer this ordeal in order to preserve their lives. I wasn’t really thinking that clearly in writing the poem, honestly, Kerry–but that is such a good point. This is one of those complex poems that is layered with a logic-defying symbolism; that is, a dreamlike illogic, which is often the most truthful kind, riddles this, for me anyway. That round circular loss, of vision, of feminine nurturing and seduction, of heart itself, to some supposedly higher cause–a baffling thing to me, but very popular in medieval times, when perhaps we were a bit closer to the mystical–what a fascinating piece this is, k.
Very interesting to me, k. Thank you too for the post note. Being Protestant I am not in loops to study many of the later-than-the-Bible saints. A few U.S. saints I know somewhat. 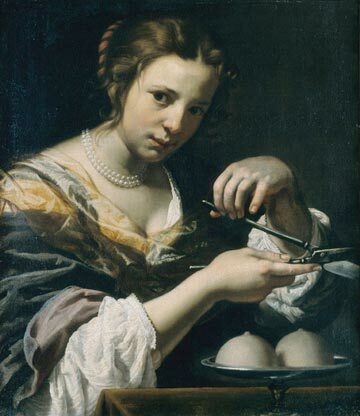 You have prompted me to read more of Saint Agatha. I do hope the baby survived. A painful experience which you do well to convey. Thanks. Thanks, M, for thoughtful comment — all of them! K.